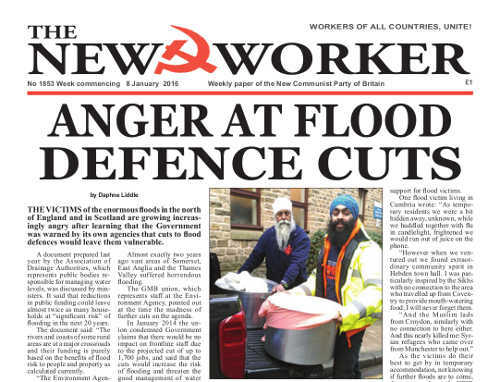 THE VICTIMS of the enormous floods in the north of England and in Scotland are growing increasingly angry after learning that the Government was warned by its own agencies that cuts to flood defences would leave them vulnerable. A document prepared last year by the Association of Drainage Authorities, which represents public bodies responsible for managing water levels, was discussed by ministers. It said that reductions in public funding could leave almost twice as many households at “significant risk” of flooding in the next 20 years. The document said: “The rivers and coasts of some rural areas are at a major crossroads and their funding is purely based on the benefits of flood risk to people and property as calculated currently. THE DPR Korea successfully tested a hydrogen bomb this week. The Democratic Korean Foreign Office said on Wednesday that the test was for self-defence, whilst stressing that the DPRK will neither be the first to use nuclear weapons nor transfer relevant means and technology under any circumstances as long as hostile forces do not encroach upon the republic’s sovereignty. Democratic Korea has previously conducted three nuclear tests: in 2006, 2009 and 2013 respectively. During an inspection tour of a remodelled revolutionary site in December, the DPRK’s supreme leader Kim Jong Un announced that his country had developed a hydrogen bomb. The first H-bomb test was successfully conducted in Juche Korea at 10:00 am on Wednesday 6th January 2016. For decades the Scottish National Party (SNP) have been clamouring to acquire legislative powers for Scotland. Now that they have them they are strangely reluctant to use them. In his 2016/17 budget statement the SNP Finance Minister delivered a budget that was virtually identical to the slash and burn budget from UK Chancellor George Osborne weeks earlier. Whereas the SNP website describes the budget as “defending and shielding the vital public services that the people of Scotland depend on”, the reality is very different. The budget will result in a one billion pound cuts programme in Scottish local government over the next two years. There will be a six per cent reduction to the local government spending grant while the eight year council tax freeze will remain in place. This will result in about 40,000 public sector jobs being lost over the next four years. He also demanded “relentless reform” in the public sector. This is a polite way of pushing for cuts and privatisation. THE PARLIAMENTARY Labour Party has been in turmoil as Jeremy Corbyn has implemented a modest reshuffle of the Shadow Cabinet in order to try to create a more united front bench. The right wing Blairites have taken Corbyn’s declarations of openness and readiness to debate all issues facing the party as a free hand to attack him, misrepresent everything he says and to do everything they can to undermine his leadership. The Labour Party has always been a very broad movement but for the last few decades the quasi-Tory middle class right-wing careerist intelligentsia have held the leadership in a grip of iron. They changed the annual conference from a policy debating chamber into a rally to worship the leader. Tony Blair with his chief henchman Alistair Campbell tolerated no open debates or remarks deemed to be “off-line”. MPs were deselected, candidate selections were stitched up behind the scenes and the whole party was restructured to entrench their hold on the leadership and to keep out the rank-and-file activists and volunteers who were fighting for social justice. Writer Armando Iannucci made a TV career out of satirising the process. They still cannot believe they failed to prevent Corbyn taking the party leadership and they are dead set on getting him out of office as soon as possible.